You're so kind to think of Tacodeli! Our gift cards make the perfect gift for any occasion. 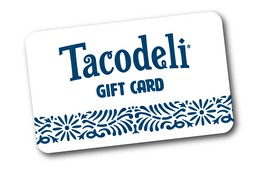 Just choose your amount and send to that special person in your life so they can redeem at any Tacodeli location. This card may be applied to any purchase at any Tacodeli restaurant.It is not redeemable or refundable for cash. For balance inquiries call the phone number to a Tacodeli's location below.